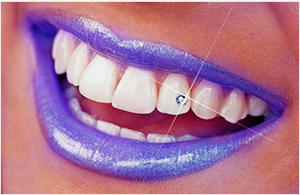 Dental jewel is a special diamond / crystal or sparkling stone, which can be attached to your teeth to enhance your smile. It’s temporary, non-invasive and painless. WHO IS A SUITABLE CANDIDATE FOR APPLICATION OF A DENTAL JEWEL? Anyone who wants to endow their smile with a jewel and the teeth to which the jewel should be attached are healthy, can be a suitable candidate for this treatment. 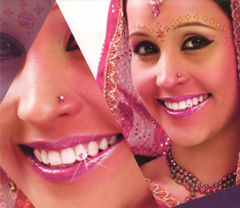 WHAT ARE THE STEPS PRIOR TO DENTAL JEWELLERY APPLICATION? During the consultation with your dentist, you will choose the jewel and the tooth, to which the jewel should be attached. If the condition of the tooth you have selected is not favourable, he/she can recommend attaching the jewel to another tooth. WILL THERE BE ANY NEED FOR LOCAL ANAESTHESIA? HOW IS THE DENTAL JEWEL ATTACHED TO THE TOOTH? After a full mouth cleaning & polishing to eliminate any stains and deposits, the jewel is stuck on the tooth with a primer and an adhesive agent. This process does not damage the enamel, which is a big advantage. You will probably need few hours to get used to the small jewel in the mouth.The dentist provides you with all instructions concerning the care of dental jewels. Most important is perfect mouth hygiene. The dental jewel can last a relatively long time, it is however limited by the stress put on the decorated tooth and dental care. If the jewel gets loose unexpectedly, it is possible to reattach it easily by the dentist. You can get a jewel colour changed in future if you prefer “something new”.